Atlanta, GA, September 19, 2016, Howard Peters, Retired Optometrist at Eye Q and Author at Howard J. Peters, has been recognized by Elite American Artists, for dedication, achievement and leadership in writing. After nearly 50 years experience in optometry, Dr. Peters decided to retire and pursue a career as an author. Prior to his retirement Dr. Peters had little experience in the publishing industry. During college in London, Dr. Peters produced bi-weekly articles on controversial issues for “The Beacon” journal. The column was titled “Philosophy of the Week” and some of Dr. Peters’ titles were “CND (Campaign for Unilateral Nuclear Disarmament) are like Ostriches Burying their Heads in the Sand”, “There is No Such Thing as an Individual”, and “What Would Have Happened if Hitler had Won the War?”. Currently, Dr. Peters is working on a novel called “Upload”, which is a paraquel of his 2007 novel “Download: An alternative story of Noah and his Ark”. As a novice writer, Dr. Peters learned a lot about himself and his writing abilities while creating “Download”. In an interview with PageOneLit.com, Dr. Peters tells of his surprise when he “got to know my characters intimately and found that there were certain things that I could not write for them to do!” Currently, Dr. Peters is enjoying his venture into writing but he hopes to eventually turn this hobby into a second career. For more information or to purchase “Download”, please visit http://www.howardjpeters.com. As an optometrist, Howard J. Peters was responsible for assisting patients by providing quality eye care. In later years, Dr. Peters pioneered LASIK and refractive surgery in the United Kingdom and also taught those procedures in the United States. At the age of 56, Dr. Peters earned a Green Card to live in the United States, a major stepping stone in his career. Through all his years in optometry, Dr. Peters learned one important lesson that he lived by as an optometrist: carefully listen to every patient, even the tiniest or strangest remarks can be extremely important. His greatest memory during his career was giving a registered blind woman the ability to see again, just because he astutely listened to every word she said. 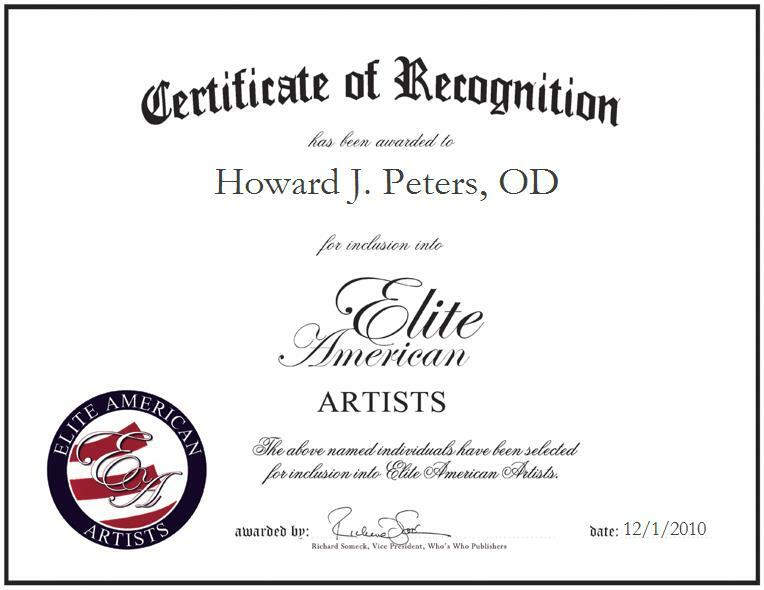 Howard J. Peters was originally selected for inclusion in EliteAMERICAN Artists in 2010. We are proud to be featuring Mr. Peters again in EliteAMERICAN Artists for 2016. This entry was posted in writing and tagged doctor, download, publishing, writer, writing. Bookmark the permalink.